Aboi's Blog: What You Don't Learn In School: High Income Nation By 2020? Based on the original post: High Income Nation By 2020? Dream On. You should spend time to read this as well. There are figures to back up the arguments. These workers will be involved in various fields, especially in the plantation sector and will meet the demands of the job market in Peninsular Malaysia, Sabah and Sarawak. In Malaysia, not enough high-wage jobs have been created. 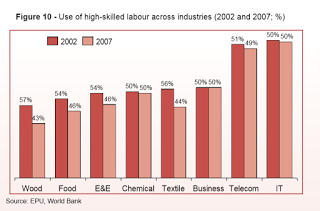 In fact the share of skilled labour has declined across industries. of the biggest declines in use of high-skilled labour. ...employers do not pay for skills, relying instead on tried and tested means such as a readily available pool of unskilled foreign workers and underpriced resources to generate profits. Immigration policies favour low skilled and cheap labour. Between 1990 and 2005, foreign labour contributed more than a third of the increase in total labour supply, and over 98% were low-skilled contract migrant workers. Malaysian firms prefer to undertake less sophisticated activities, such as upgrading existing product lines or machinery and equipment. Activities that give rise to greater innovation and require the filing of patents are undertaken less frequently. I have stressed this before back in 2012 in my blog post (Malaysia 2020 Is Not A Vision, It's A Dream) as a big problem plaguing Malaysia: We attract "mainly" low skilled workers; laborers.